SHERRI ERICKSON OF Erickson Jewelers, second from left, presents a kit with silicone rings, ring removal equipment and safety instructions to Iron Mountain police and firefighters — from left are Andrew Valeski, deputy director of fire services, Jeff Friedenstab and Jim Owen. A kit was given to Kingsford Public Safety as well. IRON MOUNTAIN –Erickson Jewelers in downtown Iron Mountain has joined with Jewelry Innovations to help first responders stay safe while wearing jewelry on the job. The company is providing free silicone rings for police, firefighters and paramedics, along with ring removal tools, instructions, and basic ring safety tips for both on and off the job. “We are happy to be able to participate in this program locally,” said Sherri Erickson, co-owner of Erickson Jewelers. 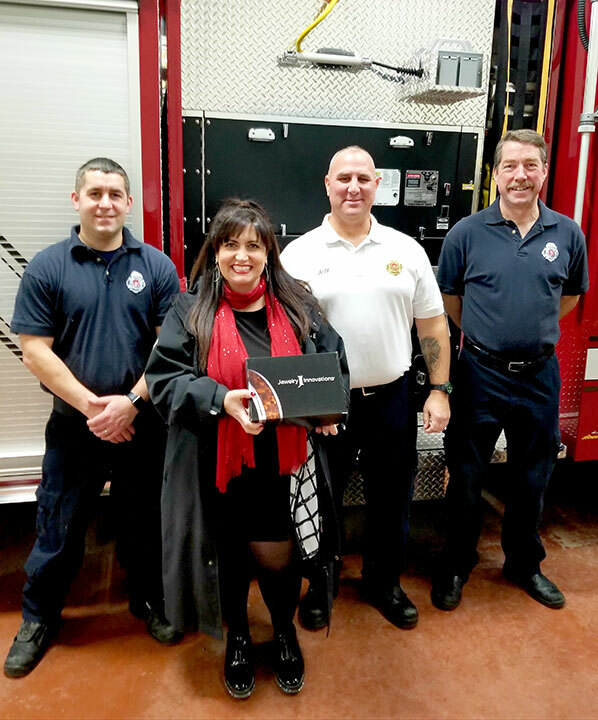 Jewelry Innovations and Erickson Jewelers assembled a free kit that Erickson Jewelers then presented to both Iron Mountain Police and Fire Services and Kingsford Public Safety. “These are just the first two departments we’ve been able to help. More kits are coming,” Erickson said. There are circumstances in which wearing a metal ring is just not safe, including the jobs of most police, firefighters and paramedics, according to a Jewelry Innovations news release on the program. “It’s a way for the jewelry industry to show its appreciation to first responders and give something back to the community,” Jewelry Innovations stated in the release. First responders who would like more information on the program are encouraged to contact Erickson Jewelers at 906-828-1307. Based in Sandy, Utah, Jewelry Innovations LLC is a manufacturer and distributer of fine jewelry and developer of high-tech jewelry alloys.